The mass reared beneficials listed on this web site often turn up in outdoor crops. Making mass releases speeds up this process and makes it more reliable as well as "insuring" against unfavourable conditions for beneficials eg. bad weather, chemical spraying, patches of low host availability. Beneficial insects will move into gardens and crops where minimal chemical spraying is done. They often reduce a pest population to below economic damage levels without us knowing or may prevent a pest getting "out of control". Good crop consultants will be aware of the beneficial species likely to be encountered in the crops they monitor. They will take into account their activity before deciding to spray. Predators and Parasites (or more correctly Parasitoids). Predators are organisms which feed on a number of their natural prey. There are several advantages in using predators. They often attack different life stages of the pest, and even different pest species. Many predators are also able to supplement their diet by feeding on alternative food sources, such as nectar, pollen and fungi. They are often voracious feeders and more robust than parasites. The disadvantage of using predators is that they usually require higher populations of their prey to work effectively and once they have ‘cleaned them up’ may disappear from the scene. Parasites (more correctly called ‘parasitoids’) are usually tiny wasps but are can also be parasitoid flies. They deposit an egg into the pest, usually at a critical life stage. The larva that hatches ultimately consumes and kills the pest. Each parasite completes its entire development on an individual pest. Sometimes many parasites may emerge from one pest. The advantages of using parasites are that they are usually extremely well adapted to their natural host and are very good at finding them even when densities of the host are relatively low. The disadvantage of using parasites is that they are mostly very host-specific and often will attack only one species of pest. They are also generally more delicate than predators and hence more vulnerable to pesticides. Because parasites spend most of their life cycle developing within their prey, they are less visible than predators, and their performance may be underestimated as a result. Entomopathogenic nematodes are often called pathogens but are technically parasitoids as theywill kill their host in the process of completing their life cycle. Other locally occurring beneficial insects. There are numerous "good bugs" that invariably enter crops if chemical spraying is minimised. Some of these may also be mass reared but most are not. They can make a significant contribution to pest control and should be factored into the spray decision making process. 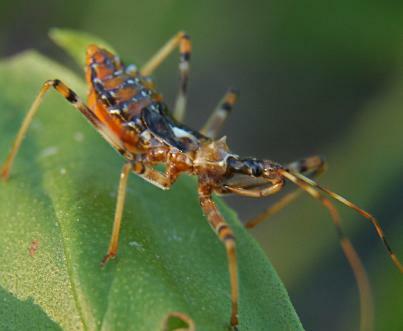 Predators: Assassin bugs (20 mm)are commonly found in tree crops and are capable of killing large caterpillars and giving a nasty bite. 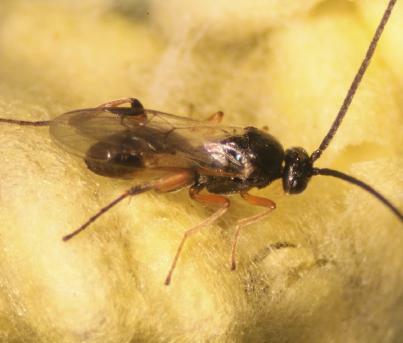 Parasitoids: Cotesia wasps (4 mm long) a parasitoid of cabbage white butterfly larva and army worms are often found in vegetable crops having emerged from their characteristic yellow or white bundles of cocoons. 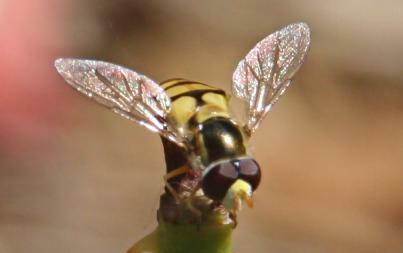 Hover fly adult - the larva of hover flies predate on mites and aphids.